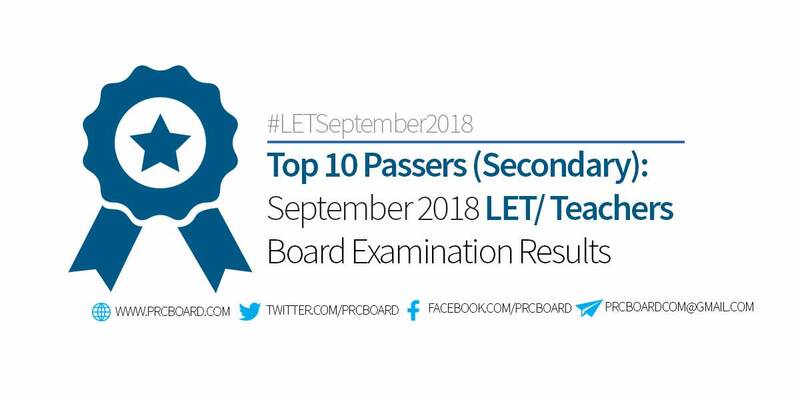 The top 10 passers in the September 2018 Licensure Exam for Teachers (LET), Secondary Level are available at this website as PRC releases the full results 52 working days after the administration of exams. The Professional Regulation Commission (PRC) recognizes the top 10 examinees who garnered the highest examination ratings in any of its administered licensure exam. Shown below is the complete list of September 2018 LET (Secondary) top 10 examinees including the school they're from as well as their rating. The list is courtesy of PRC. Record holder na kayo nyan. Highest of all times. Congrats!!! Hoping for the best but expect for the worst. Lord, let me top the boards. In Jesus Mighty Name, Amen. How did you obtain the result? Assumptions lng po nila yan. Wala pa pong results ng mga nakapasa. Mauuna pa ata ang NLE result. :) Anyway, congrats ahead to all LPTs! NANO KAY WARA KA PASA SI MIE????!! !